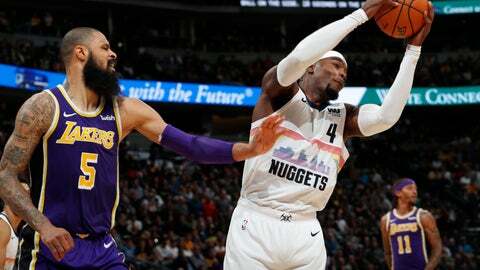 The Lakers, who handed the Nuggets their first loss of the season in late October in Los Angeles, struggled to find their shooting touch against Denver’s defensive pressure. Lakers: G Rajon Rondo remains sidelined with a broken right hand. He’s missed the last six games but is making progress. He has been cleared to take part in non-contact basketball activities. “We’ll probably get a better idea of what we’re dealing with after this flight and into tomorrow,” Walton added.